In the late and frivolous 1920s, Americans loved flying aces, motion pictures, and automobiles. America was motion crazy. We idolized the daring breed of ex-fighter pilots who flew the U.S. Mail Service by the seat of their pants. On the silver screen our romantic hero was WWI “pilot” Buddy Rogers, better known than most real-life flying aces. 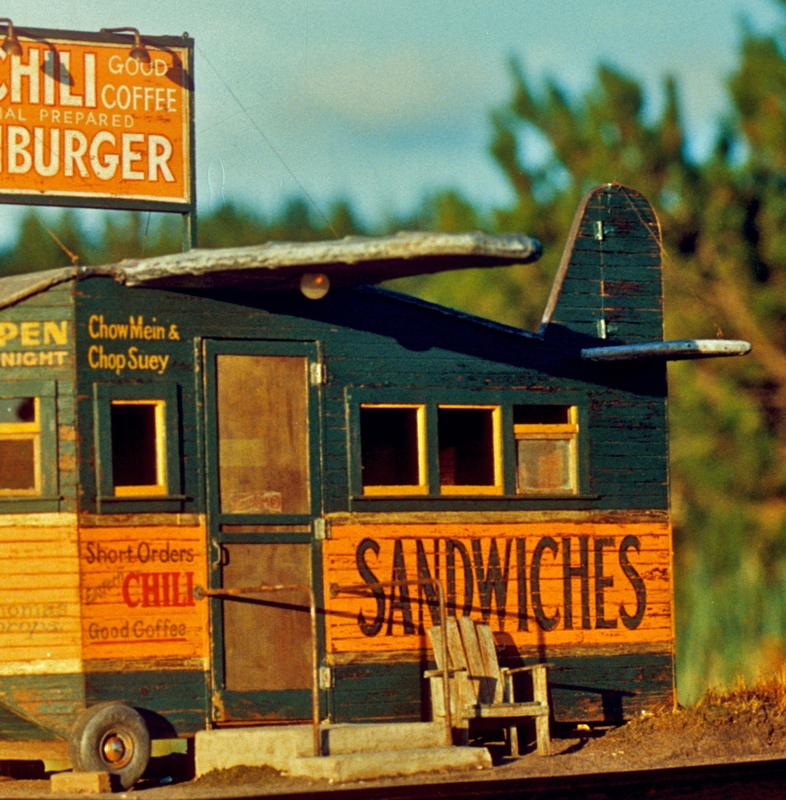 And, our developing system of highways beckoned those of us on the ground out in our new cars to picture shows, roadside restaurants, and the countryside. By 1927 we were primed for Lindbergh’s trail-blazing solo flight from New York to Paris in The Spirit of St. Louis. We wanted to be thrilled! Lindy thrilled us, sprinkling us with his stardust, and we in turn lionized him with awards, celebrations and parades. He piloted The Spirit throughout the U.S. on a barnstorming tour to encourage “air-mindedness,” leaving in his slipstream cheering crowds, popular songs and roadside attractions. 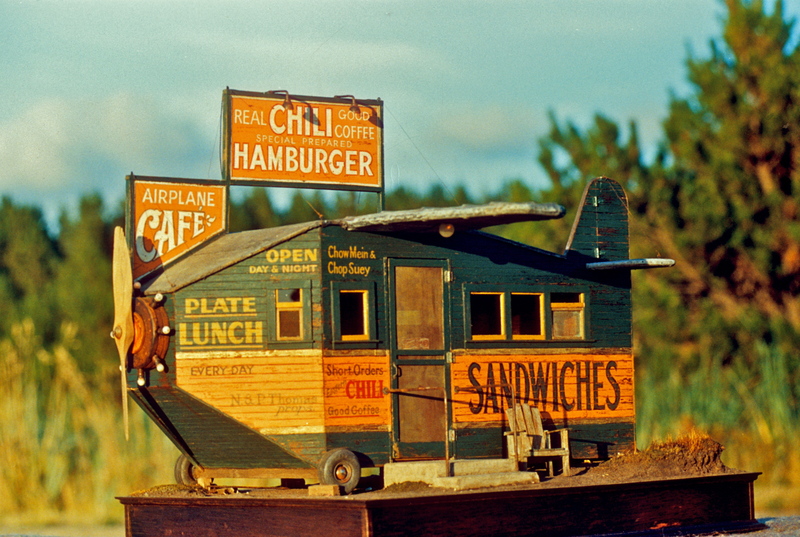 Soon airplane-themed restaurants and filling stations decorated the American landscape. If we dared not fly ourselves, we could drive to an airplane for lunch. 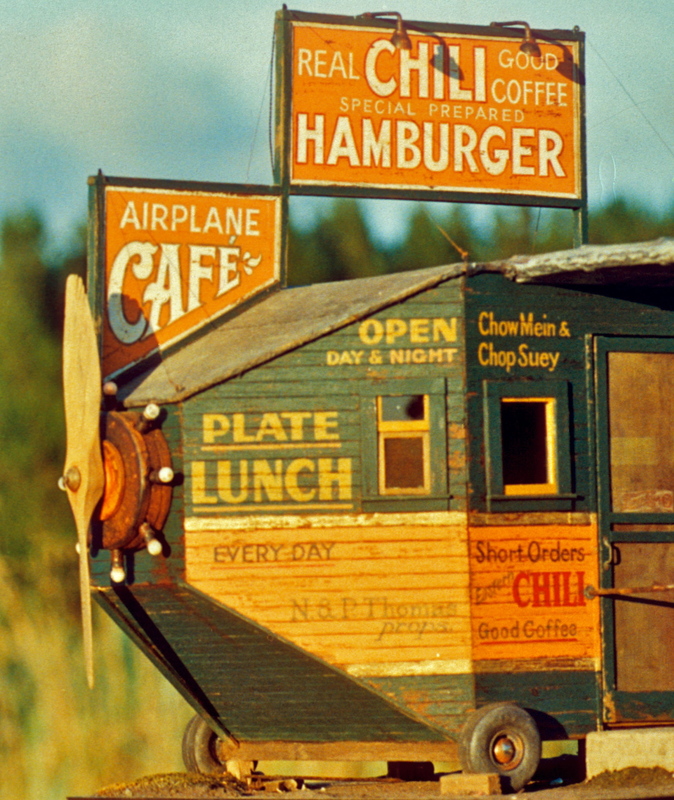 One such tip of the hat to Lindy was the original Airplane Café, built in 1927 on U.S. 101 in Los Angeles. Noel and I found the original Café in the book California Crazy (Heiman and Georges, Chronicle Books, 1985). At the time I was working in a bookstore, and had first access to all the crazy architectural books the owner ordered to feed our hunger for the quirky and clever. 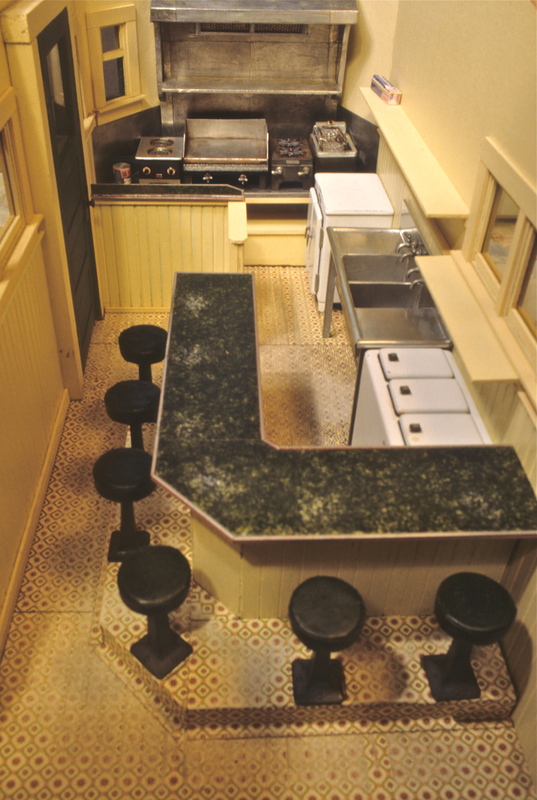 Noel adapted the design for our 1989 Guild School miniatures workshop by downsizing the original 12-window, 2-door eatery to a more teachable 4-window, 1-door project. In the process he had to maintain the proportions of the original to accommodate the highlight of the structure–its wonderful signage. The café, basically, is its own billboard. The body we made from ¼” mahogany ply. Before assembling the wall sections, we scored them to resemble individual tongue and groove boards. In the process we grayed them with Bug Juice. Before painting the body colors, we brushed on a thin coat of rubber cement, which would allow us to later remove areas of paint to reveal weathered wood, enhancing the building’s aged look. The photograph of the original was in black and white. To choose colors for the miniature, I decided to try for the rich hues found on the labels of our collection of old cigar boxes. I experimented with several combinations before coming up with the green, orange and gold. Noel hand-lettered the signs, first on paper, then transferred them to the wood using carbon paper for the light areas, and white fabric transfer paper for the dark sections. We would later transfer them back to paper for our students, who “merely” had to trace them onto the rough wood, and hand paint them. A number of building supplies came from non-miniature sources. The balloon tires came from a science and surplus catalog—those irresistible pages of what-not that some of us thrive on. These we aged by sanding down the pronounced tread, and then applying acrylic dirty-water washes. The hubcaps are domed upholsterer’s tacks, sanded, then rusted with alternating layers of dirty washes, highlighted with dabs of out-of-the-tube burnt sienna. 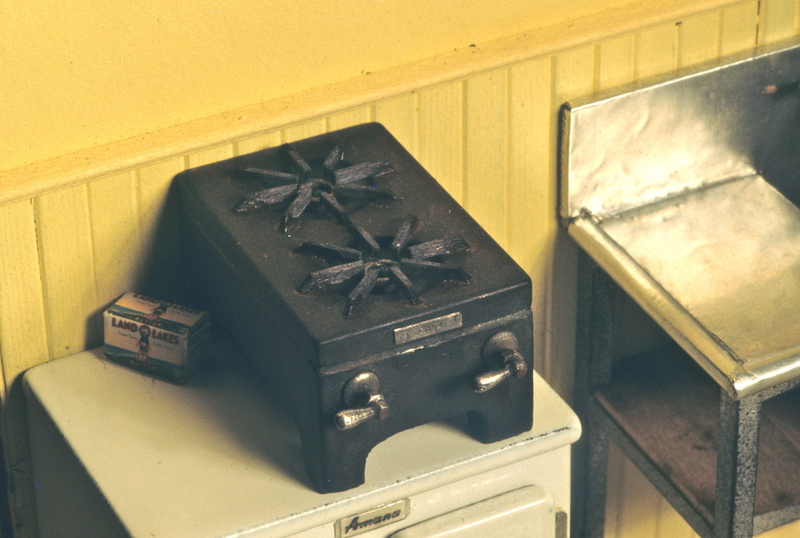 The rusted look was enhanced by sprinkling rust dust, sanded from an old tin can, over the wet paint. Before rusting the rims, we popped them out of the tires and soaked them in Patina Green, which corroded them nicely. The front handrail is made from ready-aged old bicycle spokes. The wooden propeller came from a hobby shop. It was made of exceptionally hard wood which we aged with everything we could think of—furniture Strip-eze, sanding, lifting out grain with an Exacto, and a painter’s wire brush. This too was grayed with Bug Juice and aged with more paint washes. In turn we put our poor students through all these steps, too. 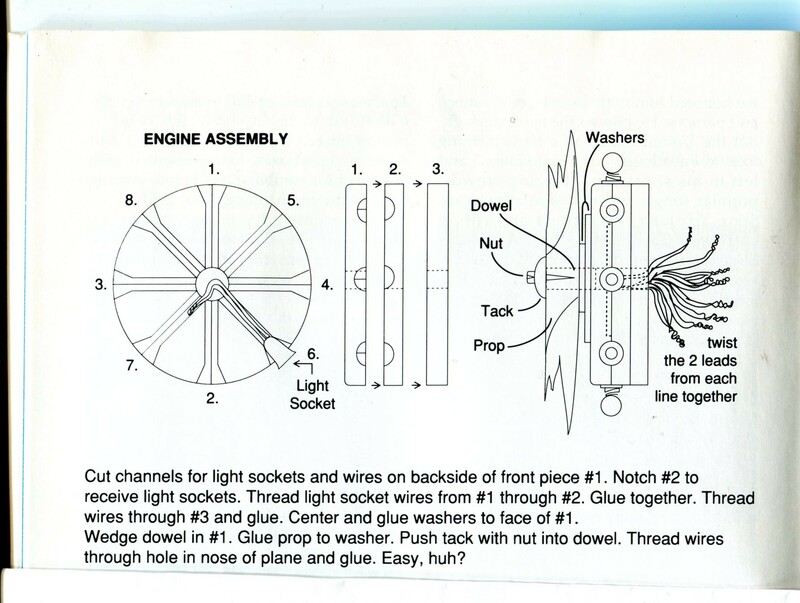 The “engine” consists of another mish-mash of supplies and finishes, beginning with layers of wooden disks and metal washers, primered and spray painted to conceal the wood grain. Noel then carved sockets out of the back, and strung tiny lights (which we frosted with glass etching acid to tone-down the light) through them. He then layered on a few more aged and rusted disks to give it more heft, and the whole unit was glued and bolted to the nose of the airplane. To create period atmosphere, like the old lighted movie marquees, we decided all the bulbs shouldn’t work. We kept at least one slightly unscrewed until some actually burnt out. Unfortunately we have no good photo of the wing and roof structure, which we built like a real airplane wing, complete with wooden ribs over which we stretched white-glue-and-water-saturated muslin to fill out the wing shape. Once dry this was painted with more dirty washes, plus Payne’s Gray and Thalo Silver to look old and airplane-ish. The final touch was to stud the wing edges with rusted ¼” nails. 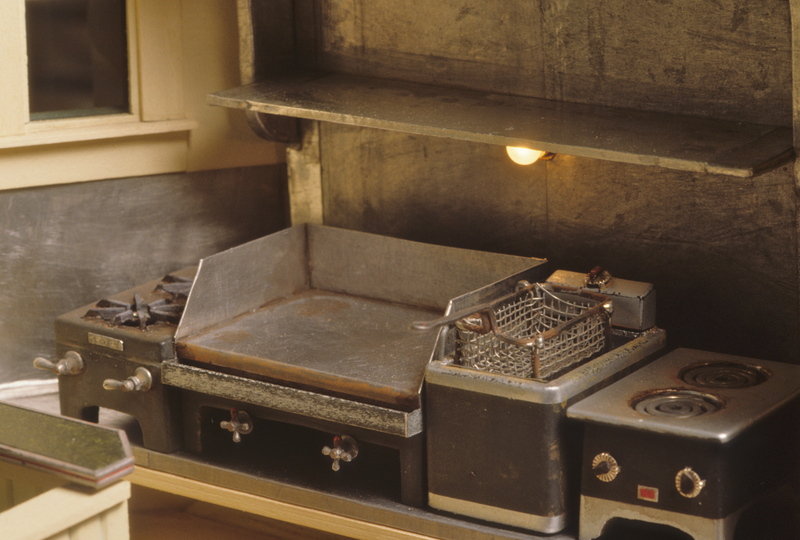 Cooking area. By the details, you would guess correctly that we each worked as short order cooks in our early years. 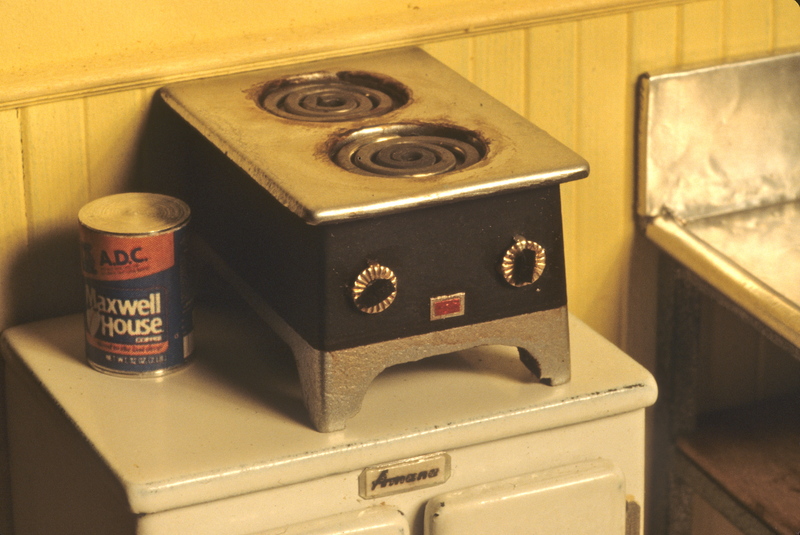 Coffee warmer. Hand-made by Noel, but the convincing detail is that readily-available coffee can to the left. More details on the interior are available in my column in the September 1992 issue of Nutshell News. It’s one thing to create something like this once. We later built two more for collectors. But the mystifying part was how we recreated all those parts of all those puzzles for every student, who then aged, finished and put it all back together, painted all the signs, in 5 days, as well as eating and sleeping. Admittedly those were marathon weeks, and we were all young, but the energy and enthusiasm required remain astonishing to me. Even more that some students dared to come back for more, and some even remain our friends today. We must have all harbored some of “Lucky Lindy’s” spirited stardust. This entry was posted in Houses, Miniatures, Teaching and tagged dollhouses, IGMA Guild School, miniatures, Roadside architecture, work style. Bookmark the permalink. Glad to know you’re still enjoying it, Linda. Truly delightful. Though my consciousness of 1930s cubbyhole restaurant accoutrements stems from the late 1940s, your perfect recreation of them certainly brings back memories. Thank you. It is amazing! I love it. Do you plan to fill it with food and dishes, pots and pans and a cook and such? It is amazing as is. I love the screen door.. All that is left is maybe a fly swatter and a few very tiny flies, lol I can smell the cheeseburgers cooking. Glad you like it ! Decorating the insides is up to the owner–we built this in 1989. We always liked to keep our rooms simple, with just a few suggestions that someone might have just walked out the door. 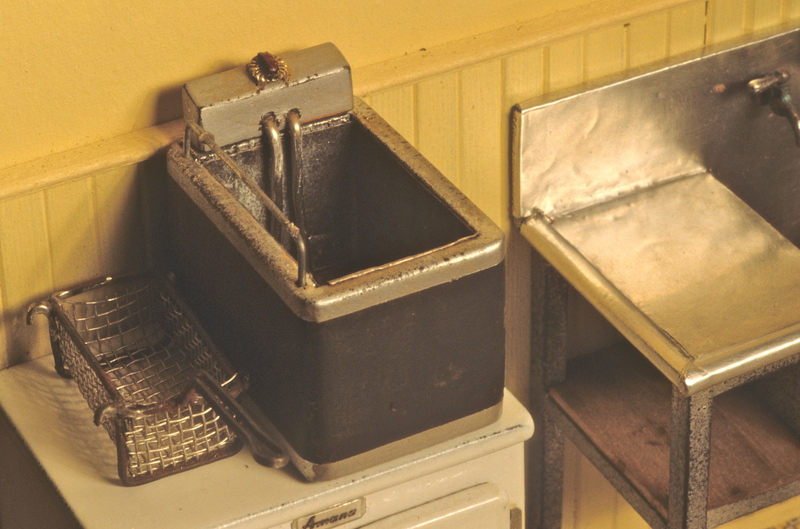 But a few plates, a coffee pot on the burner, a napkin stand–yes! Pat, your and Noel’s old, welll-used houses have inspired me from the first moment I read/saw them in an early Nutshell News. Old, worn, faded, springs coming out, missing legs,etc. these are the things that fuel my imagination and set me to working. The character that can be imparted into the weathered houses says more than a paper telling what is going on in the scene. I tried to follow your work and methods and must have succeeded because my “Old Depression Farmhouse..c.’36 won the Grand Prize in HBS’s 2001 “Creatin’ Contest.” I had such fun doing it and was so proud when I finished. I have the two of you for inspiring me to love the old, weathered, worn, etc. Cudos to you both…you certainly have my admiration, as well as have been my teachers through NN. Thanks so much. Rita, Wow! Thank YOU so much! Wow, stunning details? 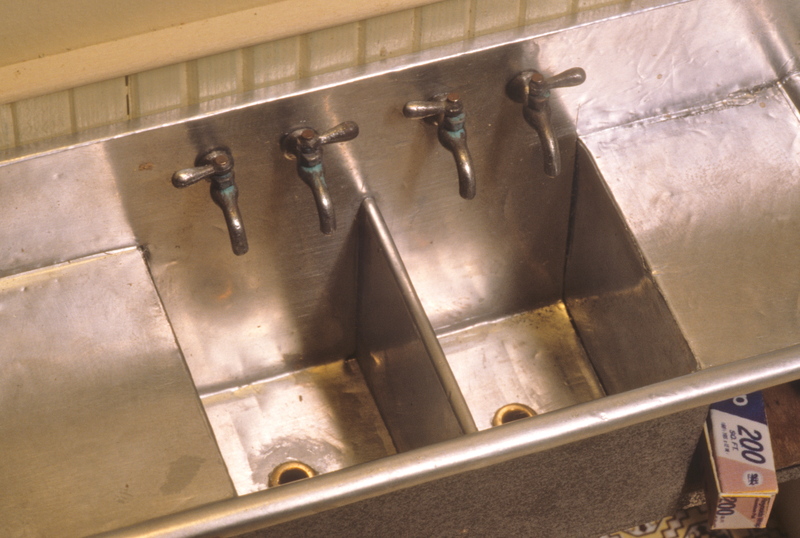 I’m curious : where did you find the taps in the double sink? Thank you, and congradulations again! Thanks Emilie. I think the faucets were a combo–handles from Vix (Victor Roming years and year ago) to which Noel added the long solder spouts.